Haggling, or “bartering” as some people call it, is an essential skill you must use if you want to get the best value for your money in Pattaya. Knowing how, where and when to haggle will not only save you money, it will leave you feeling satisfied, and it’s a very fun way to interact with the locals. Thailand is a nation of market traders and shopkeepers. Markets and family run shops are commonplace in Thailand, and trading is a way of life many people have tried at some time in their life. So Thais are very well practiced in the art of haggling. Haggling is expected in Thailand. If you don’t haggle, you will most likely be thought of as being very gullible or naive. Don’t be serious when you are haggling in Thailand. Thais are much more receptive than most people when engaged by a friendly smile or a polite hello. If you can haggle in a lighthearted, personable manner, the trader or vendor will be more willing to do business with you. Speak Thai to break the ice and give the impression you’re not a naive tourist. I always make an initial inquiry in Thai by saying “Sawedee Khap” hello (Kha for ladies), “nee towry” how much is this. The traders first impression may be that you’re well versed in all things Thai, and offer you a realistic opening price, and not the price reserved for green tourists. So what !, if you don’t know any more Thai. You’ve broken the ice and started you’re bidding at a realistic price. My own Thai speaking skills are very woeful, and apart from maybe an occasional retort of “pang nik noi”, meaning little bit expensive, I will continue to barter in English. Thais are calculated hagglers: Meaning language is no problem. I’ve watched a deaf and dumb Thai man haggle with great skill on Thepprasit market. How does he do that ?. Answer, with a calculator. Do a little shopping in Thailand, ask the price of something, 90 percent of Thais will pick up a calculator and punch in the price. It’s the easiest way to overcome the language barrier. And by handing you the calculator they are showing willingness to haggle. Tourist souvenirs for sale in Pattaya. How much to offer as an opening price really depends where you are. If you’re browsing inside a shop selling tourist souvenirs and bric a brac on Pattaya Beach Road for example, the prices are tourist prices. It may sound drastic, and the trader or vendor might feign disgust or surprise, but you should start your bidding by offering at least half the asking price. Don’t be perturbed if they don’t seem willing to haggle. Walk away as though you’re disinterested, and you’ll find they are suddenly willing to negotiate. The final price is what it’s worth to you. Quite often, even at half the asking price the vendor is making quite a handsome profit. If you walk away and the vendor does not call after you, that’s when you’ve reached their lowest price. NOTE: I said “their” lowest price. Never be surprised if you see the product you just just bought displayed in another shop at half the price you just paid. Markets in Pattaya, a great place to haggle a bargain. Local markets in Pattaya charge local prices, Thai prices. There’s no way you are going to get 50 percent discounts, at least not on most things. Local markets are the cheapest places to shop in Thailand. Don’t imagine for one minute they are going to be offended if you haggle the prices though. My wife always asks for a discount at local markets. The discounts are not large, but for example there’s a pair of shorts on sale for 400 baht, if you offer 300 baht you may well get them for 350 baht. Feel free to haggle at local markets, shops and stalls anywhere selling tourist souvenirs, trinkets and bric a brac (except Lukdod). Generally speaking you can haggle anywhere except super markets, department stores (except first 2 floors of Mike’s Mall), pharmacies etc. Don’t haggle for food, in restaurants, or in any official establishments. Many of the tourist orientated shops around Pattaya charge premium “tourist prices”. Some places I recommend you try are Thepprasit Night Market for clothes and souvenirs, Soi Buakhao Market for clothes. First 2 floors of Mike Shopping Mall for clothes and gifts. Pattaya Night Bazaar, also known as Made in Thailand Market for clothes, souvenirs, trinkets and bric a brac. 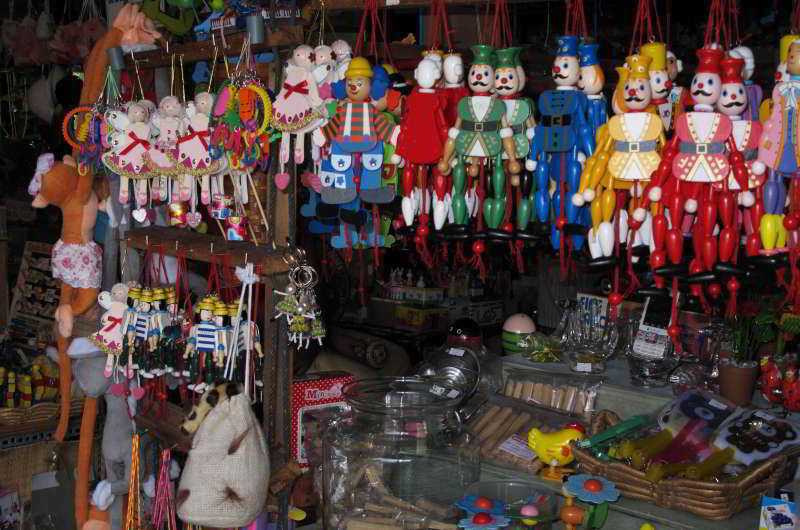 Lukodod for souvenirs, high quality gifts and bric a brac. By all means try haggling a deal, especially during low season at lower end guest houses which can’t be booked on-line. Many will offer you discounted rates for long term stays. If you want a good hotel deal in Pattaya, please start by using this Pattaya hotels and deal tips page.